Task light Kit complete with Attachable Task Light and FLCLIP for attachment to the AS12000HAT. Pictured Left, completely assembled on the AS1200HAT (Not Included). This light features a high intensity long lasting white LED lamp with an overall brightness of 7 lumens. From a 24" distance, the beam is approximately 6-7" in diameter. 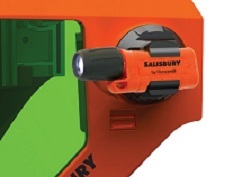 Also Includes 2 AAA batteries providing 14-15 hours of brightness.